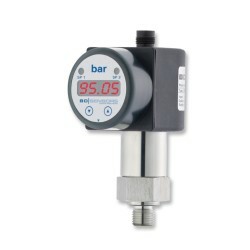 Three in one electronic pressure switch, digital pressure gauge and pressure sensor with pressure ranges from 100 mbar up to 600 bar (1.5 to 9000 psi) gauge or absolute. Switch Contacts: PNP, 125mA max for 4-20mA (2 or 3 wire) and 500mA max for 0-10V output. The DS 200 combined pressure switch, gauge and sensor is externally powered via the analogue signal electrical connection and pressure can be displayed in any engineering units via the 4 digit LED display. A variety of analog output signals maybe specified and a choice of 1 or 2 PNP contacts for use as alarms or for controlling pumps and valves. Special product features include a turndown ratio of 5 to 1 for the 3 wire 4-20mA output version for flexibility when stocking spares and an ATEX approved version of the 2 wire 4 to 20 mA output version for hazardous area applications. We are looking to show an alarm when vacuum pressure falls below -100 mbar, this need not be an electronic sensor, in this application it can be a switch that will activate at -100 mbar. Also if it would need to be ATEX rated. The DS200 has an ATEX rated option, and it will provide a PNP switch output along with the 4-20mA signal output. Can this sensor gauge be used for outdoor installation? Is the maximum media temperature the design temperature? There is no design temperature specified, only the ones mentioned below which should not be exceeded to ensure expected performance, and in the case of zone 1 safe operation. What is meant by the ‘Delay Time’ on the DS200 data sheet? The “Delay Time” refers to a selectable period of time from 0 to 100 seconds that can be placed between the event of reaching a setpoint and executing the triggering of the switch. What is meant by the ‘Switching Frequency’ on the DS200 data sheet? The “Switching Frequency” of 10Hz maximum indicates the maximum dynamic response of the on / off switching when executed. What is meant by the ‘Switching Cycles’ on the DS200 data sheet? The “Switching Cycles” of 100 x10e6 refers to the design life of the electronic switch. 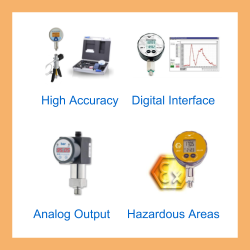 We require a combined pressure gauge and switch to monitor Nitrogen cylinder pressure. The Nitrogen cylinder is pressurized to 200 bar, and when pressure drops below 180 bar we require the pressure switch to change state. The deive also needs to be ATEX approved for intrinsic safety. We would suggest the following DS200 specification for your Nitrogen cylinder pressure drop application. Is there is a way of setting the zero point on the DS200 with a compound range of -100 to +100mbar? You can adjust the offset compensation (special menu 2 – [oF S]) & full scale compensation (special menu 1 – [FS S]), you will need a reference pressure for each to do this though. Bear in mind that when conducting the offset compensation you will adjusting -200 mbar not 0. It is hard to get the 0 mbar to read exactly zero because of the non-linearity between 0-100% span. Please select the options you require for the DS200 Combined Pressure Switch, Gauge and Sensor in your application and request a quote. Send us your enquiry for DS200 Combined Pressure Switch, Gauge and Sensor to get assistance with this product type.